In dentistry, we're often challenged with the need to manage a huge amount of information ranging from patient data, healthcare records, and the dental business operation. You use a practice management software system to manage your daily schedule, patient demographics, financials, and treatments. You use a different software to perform patient communication - to gain the ability to send out email, text, or automated phone calls for seemingly trivial stuff, and yet still have to manually go through reports to make sure the data is up-to-date. You then also use yet another software to manage your charts (or settle for a less-than-ideal one that came with your practice management software) and your images. Perhaps throw in a 3rd party app for patient to fill out their forms on the tablet, yet your are required to manually attach the form to your practice management software. In our opinion, it should be simple - one software, no bridges, just seamless direct integration to bring you the ultimate synergy on all important information relevant to your dentistry and dental business together. The use of technology to manage information is the very definition of "information technology." This is our expertise, and we can proudly say that ClearDent is critically acclaimed in this aspect for one very simple reason - everything is integrated. You can use ClearConnect to automate communication with your patients that syncs itself with your data, use a state of the art charting system to create, plan, and monitor the progress of your prescribed treatments for the patients in compliance with all Canadian colleges' recordkeeping guidelines and patient privacy acts, and implement a simple, but beautiful and powerful app on the iPads or Android Tablets for patients to complete patient forms! 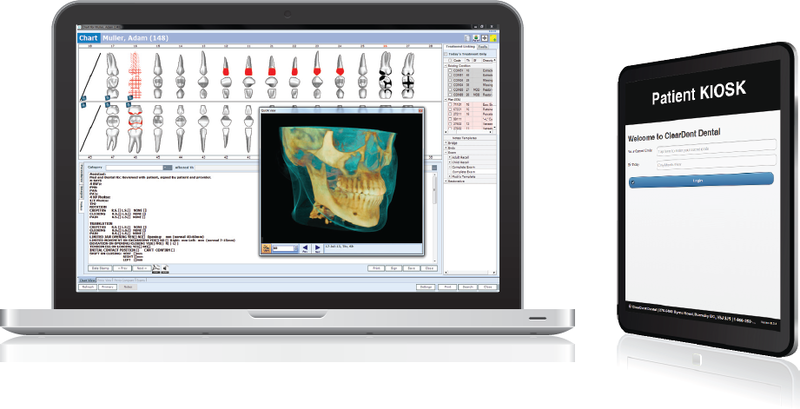 This fall, we're very happy to announce partnership with Carestream Dental to further integrate their advanced imaging system with our software, which brings high quality, diagnostic intraoral images, digital radiographs, and CBCT studies right at your fingerprint in ClearDent. To see how this synergy will revolutionize the way you see information technology in dentistry, visit us at booth G5, F5 at the upcoming Northwest Dental Exposition in Edmonton or give us a call.